I like to describe a golf drill as medication. You need to take your medication as prescribed for maximum results. You have a rash and the Doctor gives you some ointment, you take about half of it and the rash is so improved you stop. What happens? You got it, the rash comes back even stronger with resistance to the medication built up. The Doctor says one pill every four hours. I say, “do the drill every time nobody’s looking.” It is the number of PROPER repetitions that bring results with a golf drill. I dedicated an entire section of our lesson action manual, (only available to yearly members) on doing a drill properly because I consider it vital to your golf improvement or reprogramming. Yes you have to brain wash yourself, your mind, your physical movement to perform what is probably an uncomfortable movement or lets say unnatural to you. Take heart because the new movement will eventually take hold, (if you perform the drill properly), and become second nature with time. However, remember that you are never cured, only in remission! The past swing fault will always rear it’s ugly head now and again so refer back to your drill work to put the swing fault back in its proper place. One very important point about golf drills. One must fully understand the purpose of the drill. The example below is of the two o’clock drill. The purpose of this drill is to give your arms a head start on the down swing path to the golf ball so that the front shoulder, the leading arm and golf club shaft all line up perfectly at impact. Sergio Garcia says his Dad would tell him to feel as though he were pulling down on a chain to start the downswing. He said a chain, not a piece of string. The chain gives the impression that it is something heavy and you need to pull hard! Also, as you pull down on the chain your front shoulder should go upward not towards the target! David Love III said his Dad told him to pound a stake in the ground. He didn’t say tap into the ground. He said pound it! The moral to the story is pull hard and straight down not towards the golf ball!!!!!! In summary, your front shoulder must either weight for the arms to start the down swing or move in an upward direction not towards the ball or target line. The transfer of weight to the front foot on the downswing has been over emphasized to such a point that so many golfers have their front shoulder well past the ball on the down swing prohibited the golf club face my squaring up at impact. Below is a video that explains it all. If you’re not sure whether your shoulder is “off sides” or in front of the golf ball at impact, send a short video of your swing to bobbylopez@quickfixgolf.com for a FREE initial analysis. No obligation. Costco is going to hurt the golf store business big time with this one! You may have already heard and if you haven’t you’re going to now! 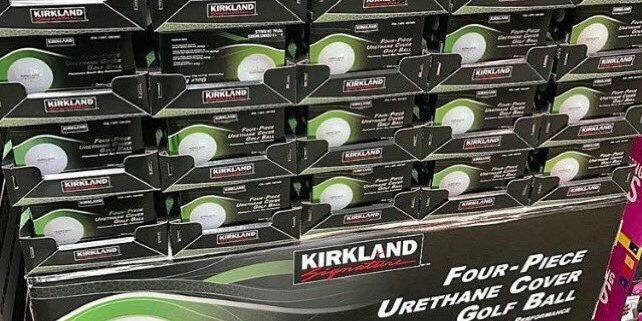 Costco is coming out with it’s own golf ball that will rival the TitleistV1 which sells for about $48 a dozen, for only $15.00 a dozen! OK so if Costco sells a cheap hard cover ball that only a hacker might consider that’s OK and has been very acceptable in the market place for quite some time now. In fact, now even Walmart sells Titlelist golf balls. However I think most of their sales are probably the lower cost balls for their clientele of golfers. But now, if Costco can in fact produce a top level golf ball equal to or as they now claim better than the Titleist V1 at less than half the cost, maron! It’s going to make the quality golf ball experience and advantage available to all the average golfers out there. I’m all for it! You have to ask yourself one question? Why so cheap? Or maybe has Titleist been ripping us all along? My Golf Spy did an in depth test on the new Kirkland golf ball with launch monitors the works. Performs in every way as well as the Titleist in spin ratios etc. accept for one thing. IT GOES FURTHER!!!!!!!! I was very fortunate that Derek Sanders, Gene Sauer’s caddie and a golf professional in his own right, allowed me to tag along while he and other fellow caddies were scoping out the greens early in the morning before others get on the golf course. I BIG thank you to Derek for giving us this insider look! Derek uses the Aim Point system as many other caddies are using to calculate breaks in the greens according to the slop measured by a level in percentages. Very interesting. Some caddies get so good at calculating the slope that they can literally straddle the line and tell you if it’s a 1.5 degrees or 2.5 for instance. Now before you run out to sign up for Aim Point system keep in mind one thing. This is only one method for calculating the break and many tour players do not pay as much attention to these calculations as the caddies do. Ball speed is the key and depending how fast you roll the ball the break off the slope will adjust accordingly. So many successful tour players are “feel” players so they shy away from raw digital readings and go with their gut. I have to admit I am that way as well. I use the I’ve been here before” method. I figure I’ve seen almost every putt there is and I’ve putted it before and remember where it went last time. First thing I determine is the speed. Speed is everything in my mind. Then I consider how much slope and how much the ball will bend at the speed I’m going to roll it. I’m mostly concerned with putts 6 feet and in. Long putts are not on my radar. Just want to get them close. If it goes in I laugh! Here’s the video and I hope you find this interesting.